Dylan Dawson has been homeless for the last two years, but in the fall he will be making a new home in the Ivy League. A recent graduate of Norman North High School, Dawson is one of Oklahoma’s three U.S. Presidential Scholars. Each year, up to 141 students are named as Presidential Scholars, one of the nation's highest honors for high schoolers. The other Oklahomans chosen for this honor are Duncan Carson of Booker T. Washington High School in Tulsa and Abigale White of Deer Creek High School in Edmond. Dawson was forced to move out of his home in 2013, and he lived out of his car or slept on friends’ couches until he found refuge at Bridges, a Norman nonprofit that assists high school students who are homeless or live alone due to family crisis. He attributes his success to his teachers through the years. Jim Ryan, a history teacher at Norman North, served as a mentor to him beginning in his freshman year. “Mr. Ryan said, ‘All of this is about maturity. At the end of the day, medals don’t matter, but leadership is making other people’s lives better,” Dawson said. Dawson also credited Sarah Bishop, music teacher at Wilson Elementary in Norman, for modeling the kind of person he aspires to be. “I think what makes Dylan special is he has the biggest heart, and he has great integrity. He has a natural intelligence, but he’s also a really hard worker,” Bishop said. The other presidential scholars from Oklahoma also have plans for the fall. White will attend Vanderbilt University to study biomedical engineering. Carson will enter Princeton, where he will study international relations, economics and history. Carson said he was pushed and developed along the way by teachers — including John Waldron, who teaches history at Booker T. Washington — and the diversity of friends that he met at school. “It really is a testament to the state that Oklahoma has three Presidential Scholars,” said Carson. 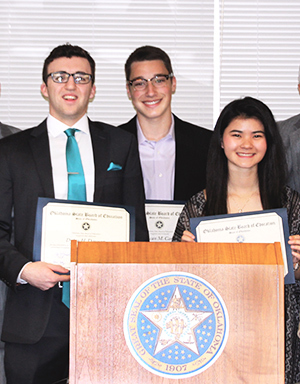 Presidential Scholars are high school students selected based on their academic success, artistic excellence, essays, school evaluations and transcripts, as well as evidence of community service, leadership and demonstrated commitment to high ideals. The scholars will be honored June 21-23 in Washington D.C.